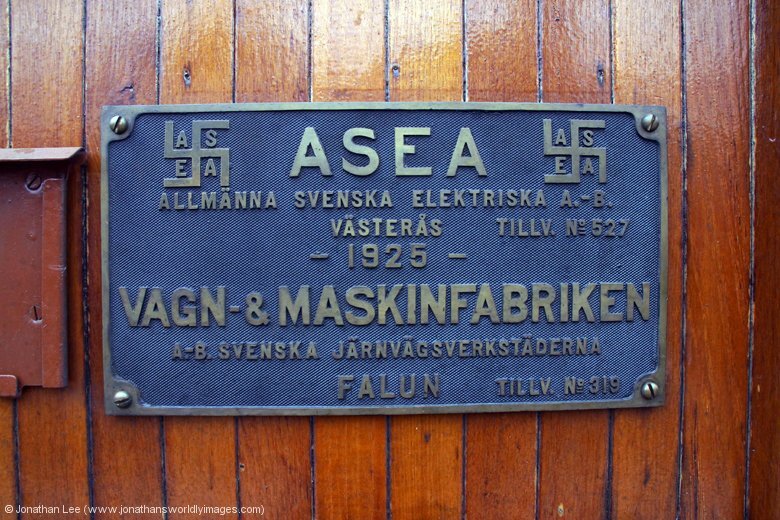 Having noticed that the Gävle Railway Museum were having an open weekend to celebrate what they termed a “big electric anniversary”, over the weekend of 12th & 13th September, I decided I’d like to have a trip across and see what all the fuss was about. 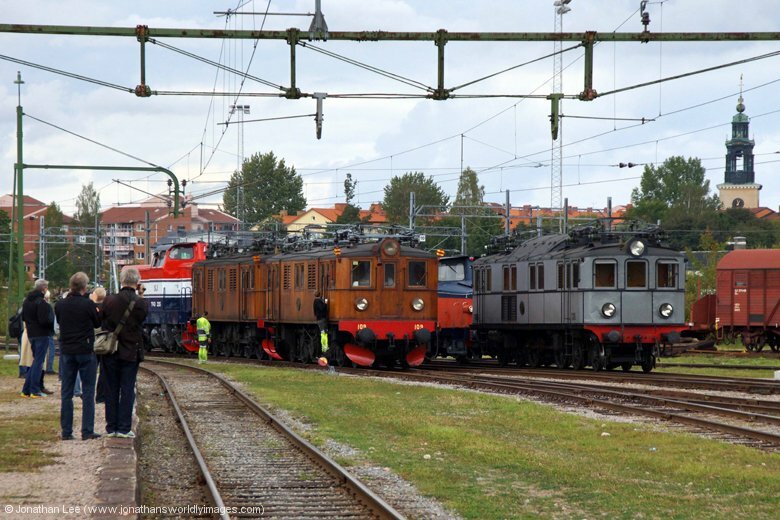 There were 6 different heritage electrics rostered to work heritage passenger trains between Stockholm/Avesta Krylbo & Gävle Railway Museum, 8 if you count a Dm3 as three engines of course! One of which was a Swiss Crocodile Ce6/8 III 14305; which had surprisingly been used to work different legs of a charter that ran all the way from Switzerland to Gävle; unfortunately though it had suffered a hot axle box in Germany and had been left behind at Berlin along the way. The fault had been rectified and efforts were made to move the Croc to Gävle to still take part in the weekend gala. Having just returned from Sweden, which was my only ever visit, I was quite looking forward to going back and as the flights were a lot cheaper from Copenhagen back to London I decided to have a day in Copenhagen doing GM’s on the way home; it was basically a smash and grab long weekend but with an Interrail ticket that would be used on two more trips after this one; hence the 22 days validity. Is about a 3 minute walk from Uppsala station. It was about as cheap as they come with en-suite bathroom in Sweden at £49 and my room was basically a box room with bunk beds, the lower being a lot wider than the upper, but with enough room to move about and had a very clean small bathroom and even a work desk. There was no window in the room and WiFi was free and very strong. Breakfast was included in the room rate and bizarrely was served from 0600 on a Sunday morning! Is only about 100m from the station entrance. It’s a hotel that only seems to have rooms with shared bathrooms but was a decent sized hotel nonetheless with clean rooms, which were a decent size and had a sink with shower gel and a towel in the room. The bathrooms were clean as well but a bit like public toilets; still the shower was spotless when I used it and the water piping hot. Breakfast wasn’t included in the room rate but was available for DKK65. It’s always a good idea doing an over-day after being at work all night! Unfortunately I’d been rather busy at work for the latter part of my shift and when I left, just before 0700, 1S25 was still stood in the platform at Edinburgh and with no loco attached! It should have departed at 0415 but due to ETH problems with the stock 67011 was being replaced by 67030; the train ultimately being cancelled due to the train still not being able to produce power, even after the loco swap! Thankfully my train to London was on time but as it was a Saturday morning 1Y11 05xx Newcastle – Kings Cross was wedged; boy was I glad of my reserved seat when I boarded at Newark; 91117 did the donkey work to Kings Cross while I checked my eyelids out for holes…..
Sure enough my flight was over an hour late and while the journey was 2h30m to Stockholm it flew by as I again caught up on some much needed sleep. I was aiming for NT94 1755 Stockholm – Narvik when I landed at Arlanda airport, which was 1821 off Arlanda Central. We landed with plenty of time to make it but then taxied all the way round the airport to park on a stand at the opposite side; I was following on google maps to try and figure out where Arlanda Central station was in relation to us. The plane doors opened at 1808 and as usual when you’re in a rush nobody seemed to hurry in front of me! Luckily passport control only took a few minutes and then the heat was on. After a mad run, basically the length of the airport, I landed at Arlanda Central platform with 2 minutes to spare; not helped by the fact I’d gone down to the Arlanda Express platforms first, which was a nice affair when trying to hurry back up the very long escalators! While gathering my breath still, I boarded towards the front of the train as just noticed a wheelchair being lifted into a set of doors in front of me; sure enough it was Dave U lifting Redhill’s wheelchair on board, accompanied by Fly! 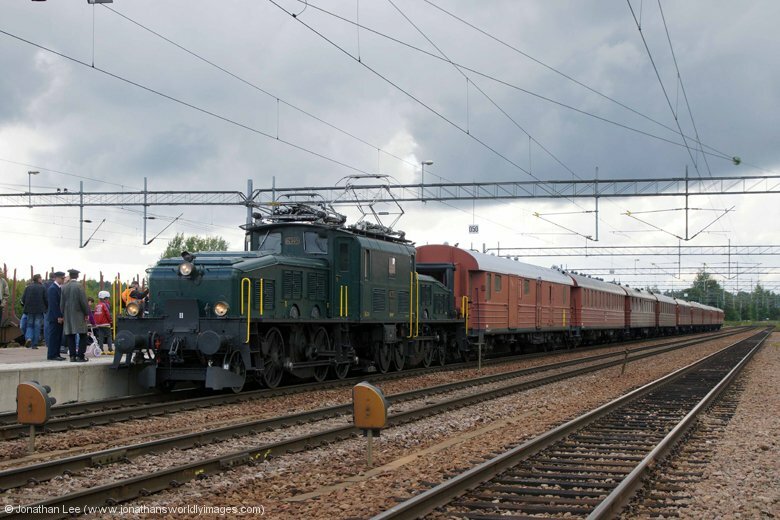 While I’d already been sms’d some gen from Des about the Uppsala narrow gauge running until 2300 that night Dave & Redhill filed me in on the rest of what was offer for the evening en-route to Uppsala with red & while SJ Rc6 1334 doing the honours on NT94. 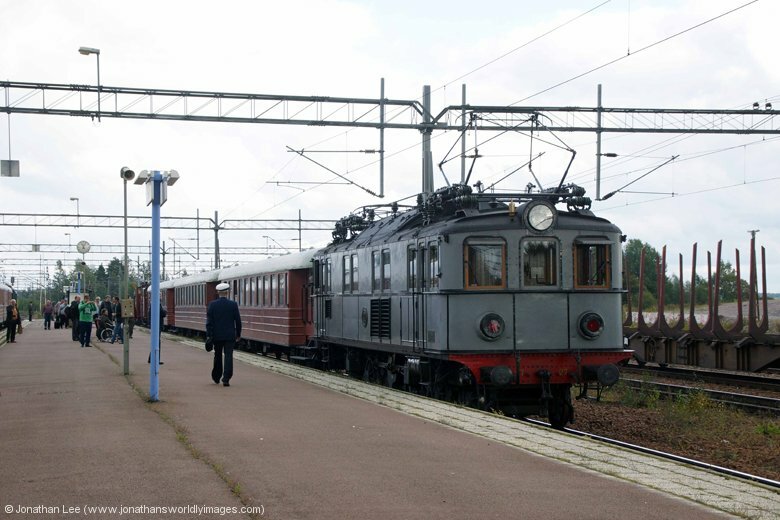 There were plenty of other English cranks about at Uppsala when we arrived, most, if not all, of whom were going to do a move on the narrow gauge; which had a DMU a diesel and a kettle out that evening. I’d decided on sheeping Dave U on an EMU back to Arlanda Central for Rc6 1340, possibly, on a vice EMU turn back to Uppsala. 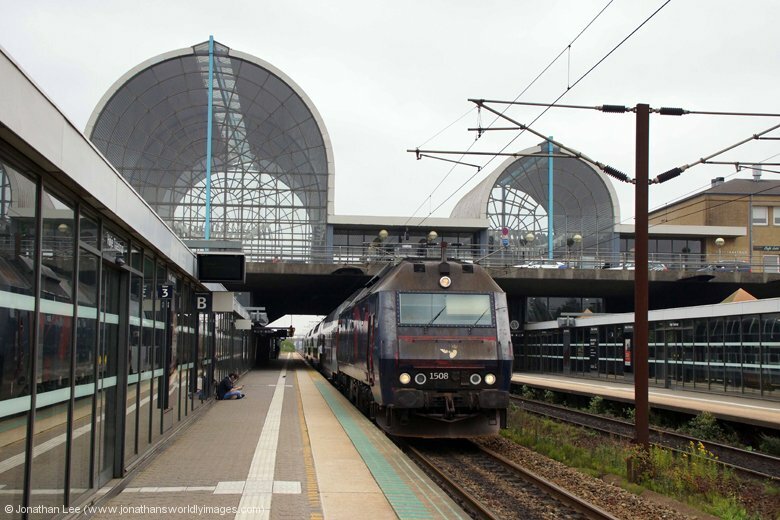 Y planned out and back to Knivsta to cover the T&T Rc6’s on the Stockholm – Uppsala circuit could wait an hour. Apparently Interrail passes aren’t valid on the blue/white EMU’s that cover the Stockholm Älvsjö circuit and when we walked down the 1856 departure from Uppsala to find a group of about 8 ticket examiners we thought the move had gone out of the window. 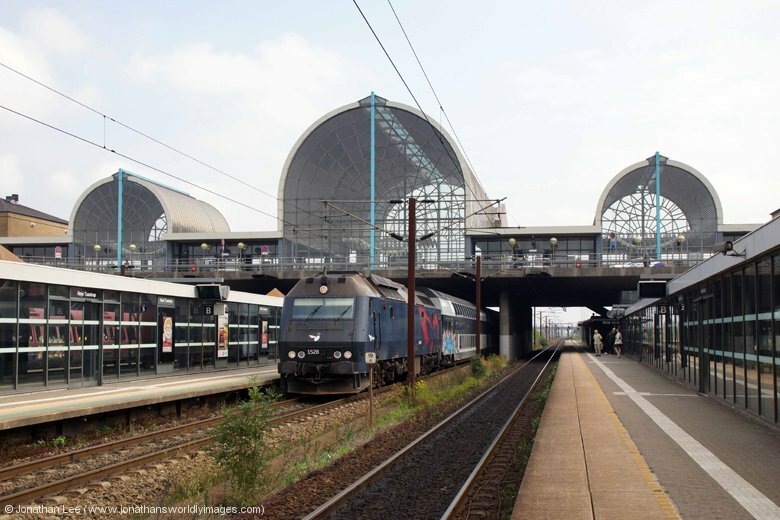 Dave decided to push the boundary and went to present the Interrail to the mass of grippers, the result being it passed around a few of them and a bit of shoulder shrugging and us being allowed on the train; which wasn’t expected but very welcome. They ruthlessly gripped the whole train between Uppsala and Knivsta, apart from us! Sure enough Rc6 1340 turned up with 296 1711 Linköping – Gävle and was the second Rc6 out on that circuit that day with 1411 having arrived at Arlanda Central as NT94 was departing, with 281 1710 Gävle – Linköping. Back at Uppsala the congregation of English folk hanging around started to disperse as people went to do their different moves; including me as I boarded the 2011 Uppsala – Stockholm on my own to do Rc6’s 1356/1365 out to Knivsta for 1376/1363 back on the 2011 Stockholm – Uppsala. After my quick move I went to check in to the Hotel Centralstation, which is about a 3 minute walk from Uppsala station. It was about as cheap as they come with en-suite bathroom in Sweden at £49 and my room was basically a box room with bunk beds, the lower being a lot wider than the upper, but with enough room to move about and had a very clean small bathroom and even a work desk. There was no window in the room and WiFi was free and very strong. Breakfast was included in the room rate and bizarrely was served from 0600 on a Sunday morning! After checking in I went in search of food and found a decent Chinese restaurant about 5 minutes’ walk away and the China River rustled up a decent Kung Pao, which was a hefty portion as well, for SEK115. Those wanting to stuff themselves silly could do, at the eat as much as you like buffet for SEK135. Not feeling quite as tired as I probably should had my lack of judgement got the better of me and with plenty of time spare before IC85 1720 Östersund – Stockholm arrived I dropped my bag at the hotel before heading over to the station; where Rc6 1390 turned up with IC85 as Dave & Redhill had predicted it would. They’d also predicted that red/white Rc6 1330 would work NT92 1835 Göteborg – Lulea, which was correct, but they hadn’t predicted it would be 20 minutes late; this ultimately had me back at the Hotel Centralstation after midnight, by which time I was more than ready for bed but bizarrely couldn’t sleep! I should have slept like a log but gave up at 0600 and got up for a shower and breakfast instead. Needless to say I was the only person in the breakfast room when I got downstairs at 0620 on a Sunday morning! The choice of food was decent and of course it was all fresh and mostly covered over as I was the first to sample any of it. As was always going to happen, I saved myself a bit of money and allowed the hotel to provide me with sandwiches, fruit and biscuits for lunch; strangely they had no pastries or cakes! It seemed like a sensible idea to cover the Uppsala – Stockholm turns again that morning as SJ had a tendency to swap locos on the sets overnight; not on this fine morning they didn’t though and I ended up with the same two pairs I’d had the previous night with 1363/1376 on the 0711 Uppsala – Stockholm and 1365/1356 on the 0711 Stockholm – Uppsala. Back at Uppsala the place was dead but sure enough cranks started creeping out of the woodwork for the first train of the Gävle Railway Museum “Electric Gala” as Rc1 1007 made its way from Stockholm with effectively the 0740 Stockholm – Gävle Railway Museum, which changed train numbers at Avesta Krylbo. 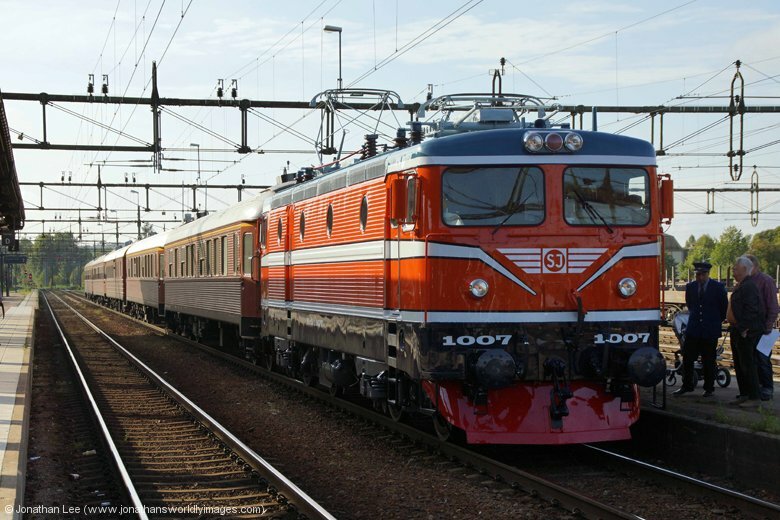 The rather splendid looking 1007 was spot on time as it departed Uppsala in its orange glory. The front coach of the train had been empty on arrival into Uppsala but had now found itself filled with cranks; and with cranks being cranks Redhill & Dave U were dossed out in a compo with the curtains drawn and lights out, having done Rc6 1335 into Stockholm that morning at stupid o’clock! 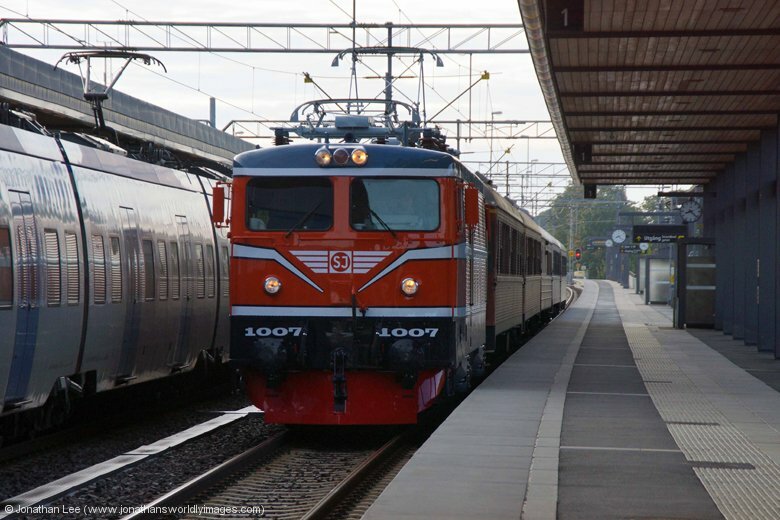 Just as we departed Rc6 1331 arrived into Uppsala with NT93 1240 (P) Narvik – Stockholm and no sooner had we got out of the platform did a very jolly gripper come into the coach and star5 chinging people up the SEK300 for the journey to Avesta Krylbo; I was quite glad of the fact he had too as I’d pre-booked the “City Express” train online just to make sure I could get to Avesta Krylbo as the conventional options on a Sunday from Uppsala were a little limited to say the least! It was a decent journey to Avesta Krylbo and a punctual one. En-route we passed an EL13 running light engine in the opposite direction; strangely away from all the festivities that were occurring at Gävle. 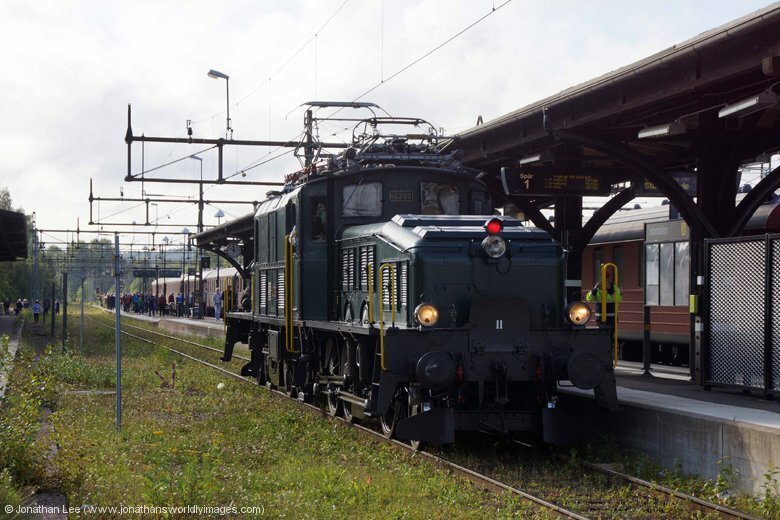 At Avesta Krylbo there isn’t a great deal happening and the station looks like a station you’d usually associate with one in the middle of nowhere yet when SBB Crocodile Ce6/8 III 14305 arrived with the 0730 Gävle Railway Museum – Avesta Krylbo the place certainly livened up. 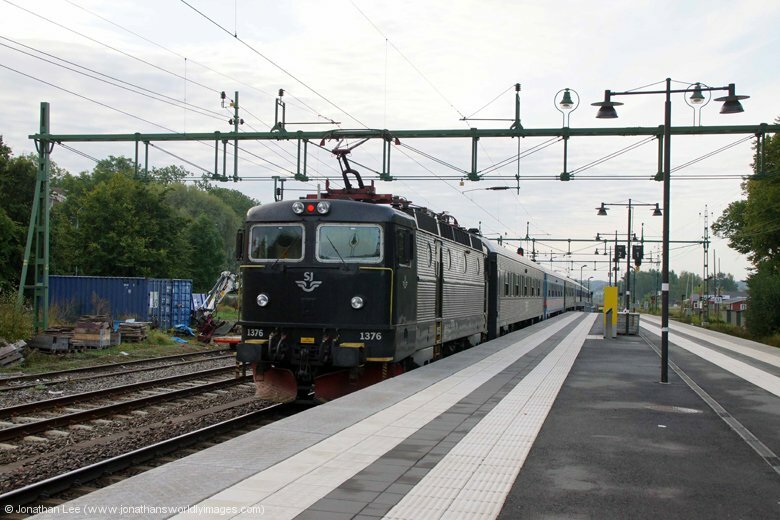 As predicted everyone flagged Rc1 1007 on its run to the Museum and did the Croc instead on the 1020 departure behind to Storvik; on board which we managed to negotiate a far of SEK300 for the whole journey to Gävle Railway Museum with a break of journey at Storvik. 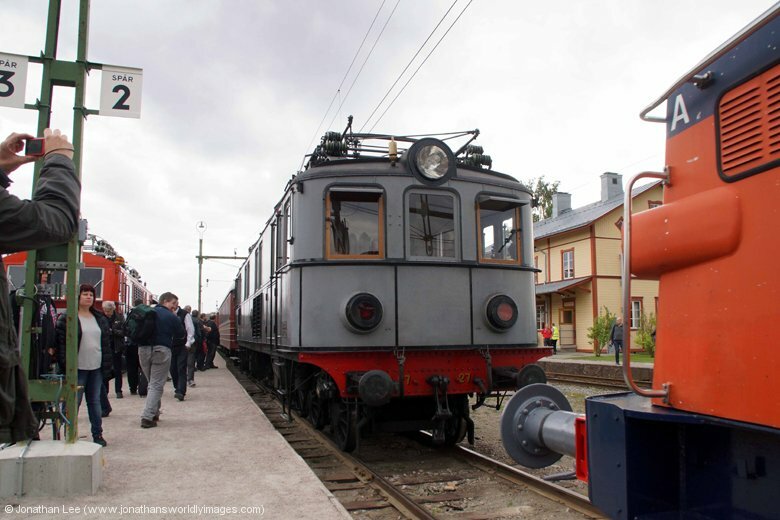 We should have ultimately paid SEK300 for each journey made but the staff saw sense and allowed us to break the journey; they also had to do a bit of negotiating on our behalf as when we departed Avesta Krylbo Pa27, which was rostered to work the 1105 Avesta Krylbo – Gävle Railway Museum was in fact on the Avesta Krylbo end of what turned out to be a train that was T&T with crocodile 504, which had done a shuttle at the museum the previous day and everyone but me had already had! As the Crocodile needed to stop every 10 minutes to check its axles and prevent any hot boxes the 1105, behind us, was booked to overtake the 1020 at Storvik; when it did the train crew spoke to the crew on Pa27 at the rear of the train and the loco was prepared and certainly gave more than a shove out of each station from then on; whether it had actually worked before Storvik nobody knew but everyone was quite pleased with the fact it had been allowed to push and there was more than one person stood at the back of the train auditing the buffers of Pa27 to make sure it indeed buffered up. 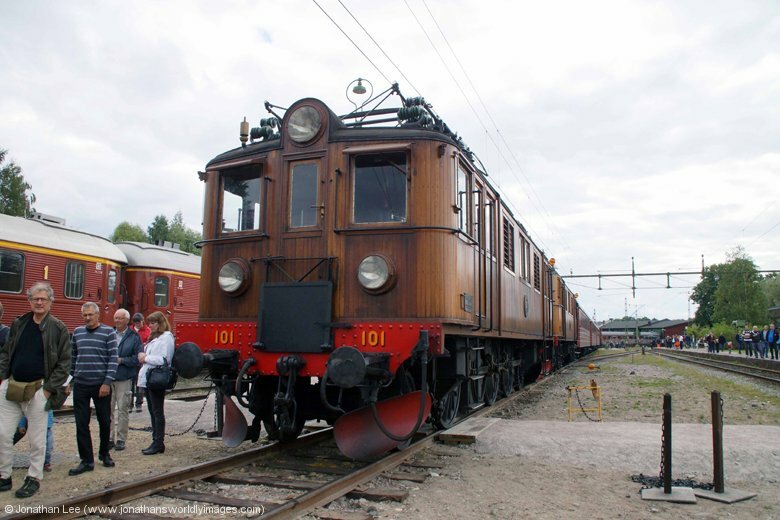 To be fair you could feel it as it was clearly more powerful that the thing on the front; which apparently was only there as the crew were being lazy and it was fully understandable when we arrived into Gävle Railway Museum with number 504 on the blocks. There were a lot of engines scattered about but those doing the shunting were very efficient as Pa27 was quickly uncoupled from the rear of the train and dragged to an unwired road by a shunter and wooden boxes D101/D109 were then dragged off an unwired road by a different shunter and attached to the front of the train. 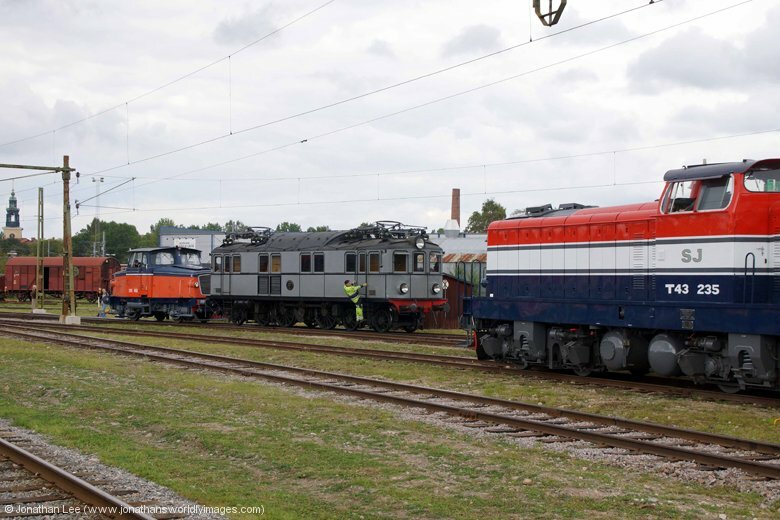 While Dave U attempted to get the staff to use one of the shunters to drag us out to Gävle station everyone else discussed the fact that D101 was rostered to work on its own and would there be two drivers provided to allow both locos to work? 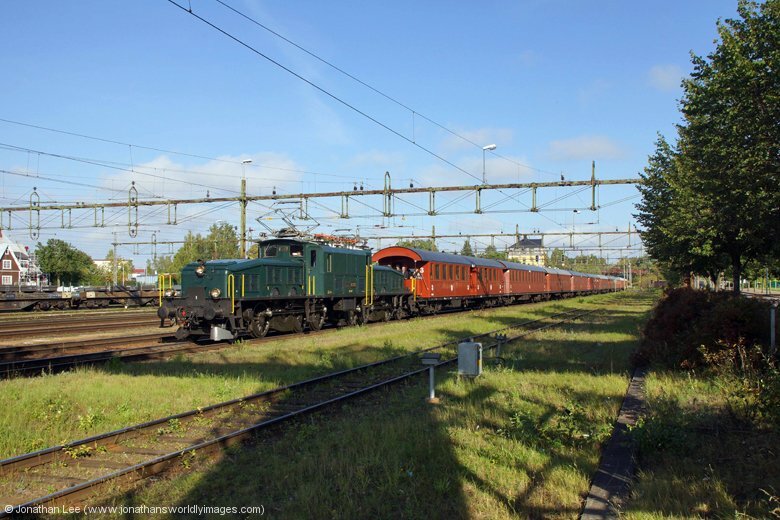 By the time we departed, with a driver in both D101 & D109 and both with pans up and powering, Crocodile 14305 had arrived in with the slow train from Avesta Krylbo and the Dm3, which was pretty much the highlight of the day, had been dropped onto the rear of the train in readiness for it to follow our 1332 Gävle Railway Museum – Avesta Krylbo at 1418. 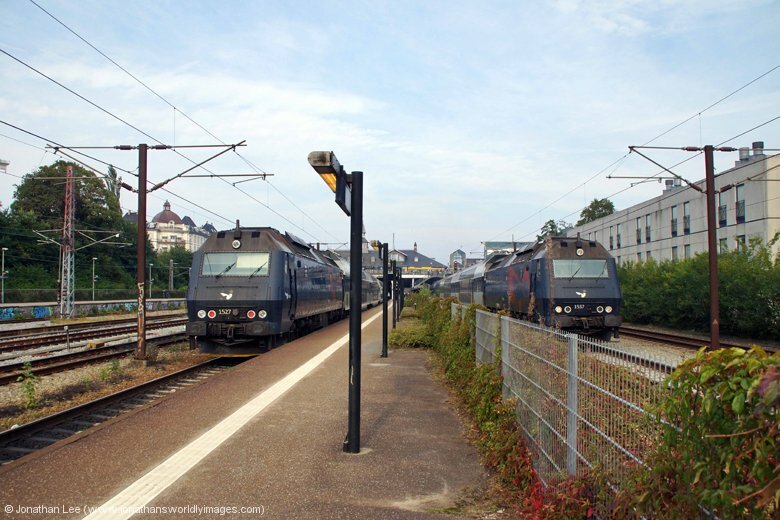 Not wanting to basically miss one of the workings of the century as far as electrics in Sweden goes, the general consensus was to get off at Gävle and wait for the Dm3 there as there’d be some egg on face gen if it failed before Sandviken! 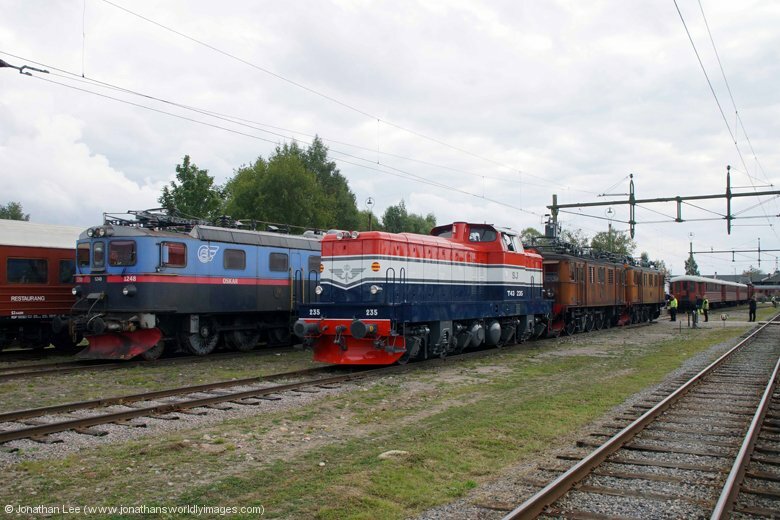 There’d been talk of walking back to the museum and doing the Dm3 to Gävle then doing an Rc6 on the 1510 Gävle – Linköping to Stockholm and then NT94 1755 Stockholm – Narvik to Arlanda for the tour into Stockholm with Ra846; thus actually gaining two engines but not really doing the Dm3 justice; so we waited at Gävle like the sensible folk! 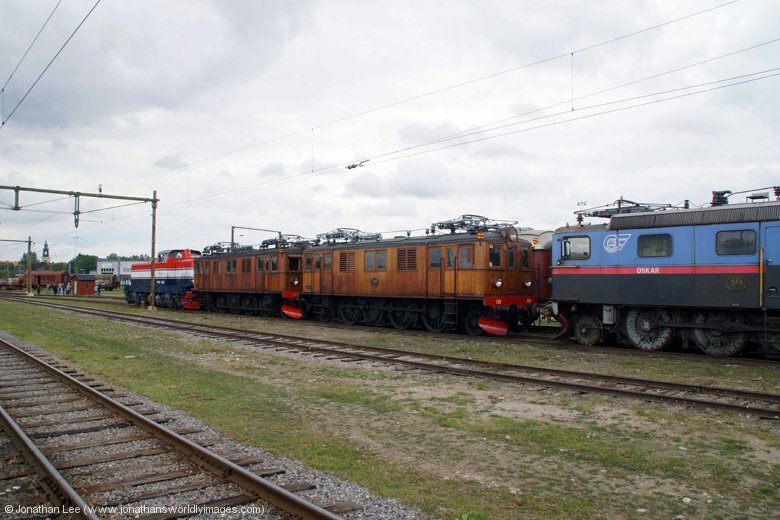 The highlight of the afternoon for some was the parallel running of the 1418 & 1421 Gävle Railway Museum – Avesta Krylbo trains with the Dm3 on one and the crocodile on the other; punctuality of said parallel running wasn’t the best though as Ra846 got in the way at Gävle station, which was on its way light to Avesta Krylbo to work our set, the City Express, forward to Stockholm. Once that had gone the Dm3 with the 1418 ex the museum then went into the opposite platform to which it had been advertised and awaited the crocodile to arrive and randomly depart first. It was then like a game of cat & mouse down the only double track section in the area with each set passing by one another until the track ran out; of course we got priority over the crocodile, which probably had to have a breather by the time it had done 5 miles anyway; it was 90+ years old after all! 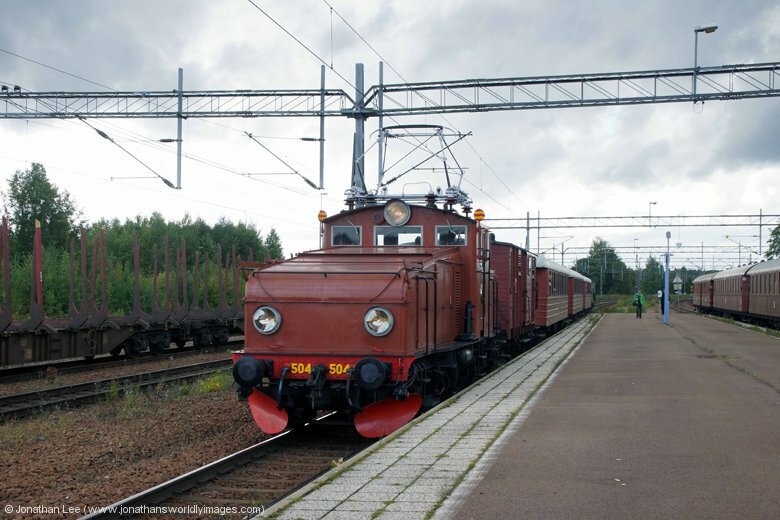 The Dm3’s had spent their life working the iron ore trains from Kiruna to Narvik and had originally been built as twin units and both designated Dm when the middle units were built they were allocated Dm3; hence the whole unit being referred to as a Dm3. They can’t have worked passenger trains as the couplings were specifically designed for the iron ore wagons and it was attached to the stock with an emergency coupling, which really did give a jolt as it set off! An engine just looks big when in some kind of authentic freight livery and this Dm3 was still in its MTAB livery and faded at that and it had more rods on the wheels than the biggest kettle you can imagine; none of which were in sync at all I might add. It was an interesting journey to Avesta Krylbo to say the least and not wedged either and bizarrely a free one as the grippers seemed to check everyone else in the coach then walk right by myself & Dave and I even had money in my hand ready to hand over! Ra846 was already sat in the yard waiting our arrival and once the crocodile eventually arrived behind us a mass shunt round occurred with the Dm3 running round and dropping on the rear of the crocodile’s train and the crocodile then running round and dropping on top of the Dm3! 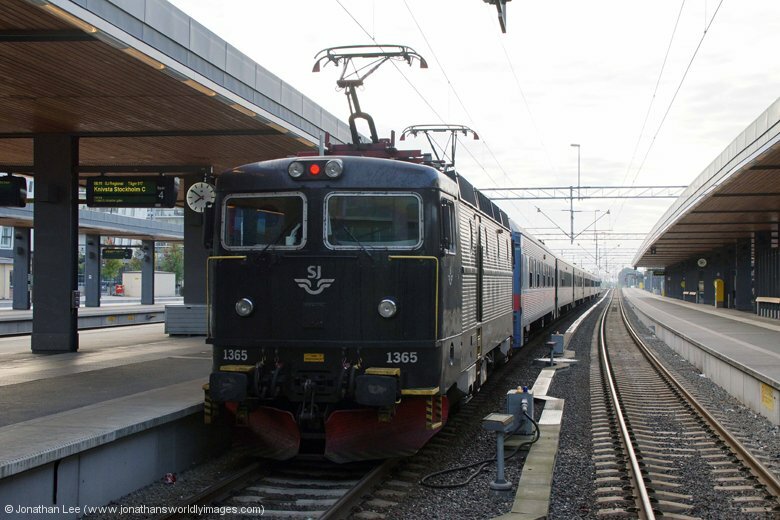 Meanwhile Ra846 was dropped onto the City Express stock to work 20875 1745 Avesta Krylbo – Stockholm, which turned out to be a very empty train indeed and even emptier than the outward had been. 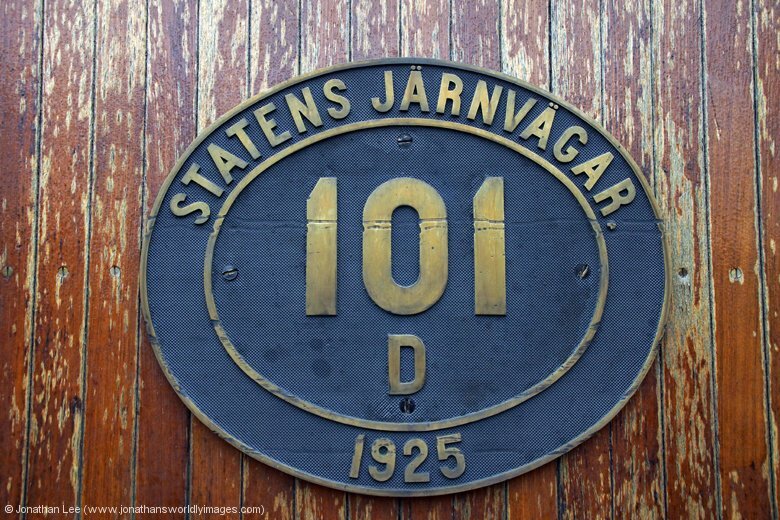 As our train was slackly timed we’d hoped to arrive early and make NT94 1755 Stockholm – Narvik with Rc6 1331, it was a minus 10 but we thought our luck was in when SJ’s real-time information showed the 1745 Stockholm – Mora to be 20 late and the Narvik had been re-platformed at Uppsala to go round it. 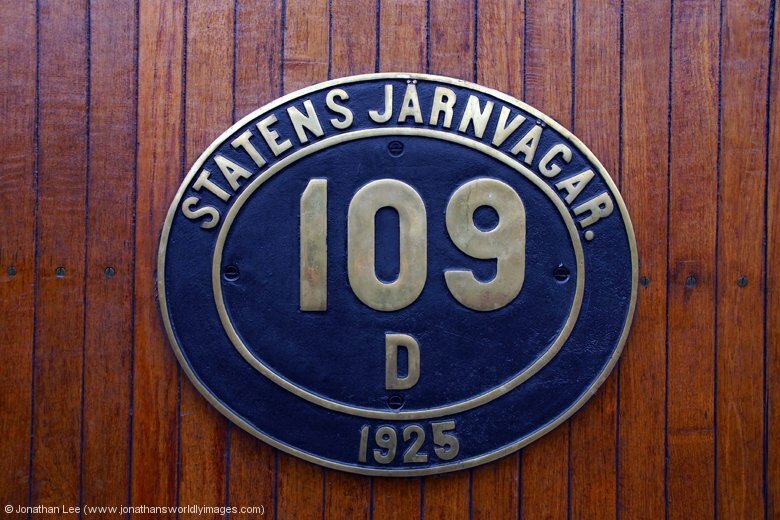 But no, we got held at the loop just outside Uppsala station for 1387 to pass with the Mora and while 1331 departed with the Narvik. 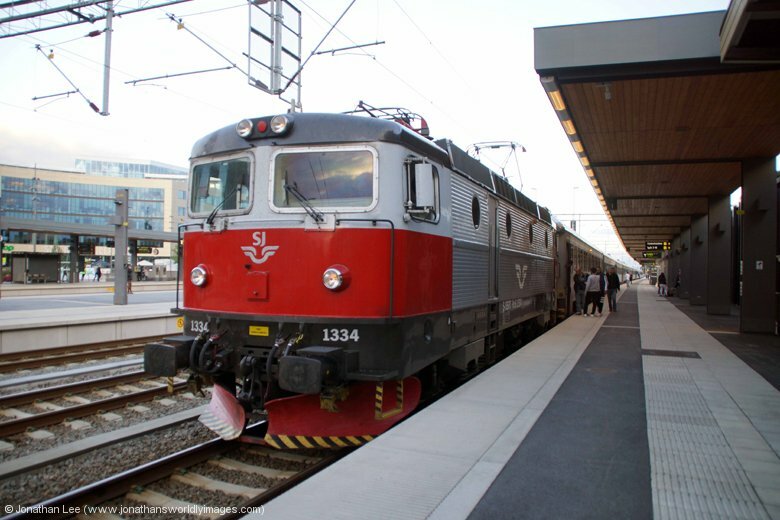 So it was Rc6’s 1363/1376 to Knivsta on the 1911 Uppsala – Stockholm, exactly 12 hours after I’d done them for the same distance on the 0711 ex Uppsala, for an EMU to Arlanda Central; which didn’t have a raft of grippers on board on this occasion. 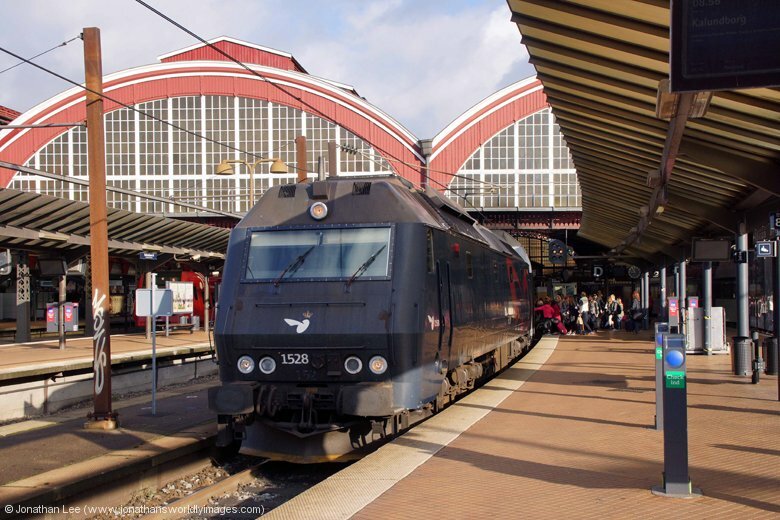 IC28 1945 Stockholm – Falun revealed 1374 for the run back to Uppsala where food had to be sought from the Co-op outside the station as nothing else was open; yet a Co-op was at 2100 on a Sunday night! 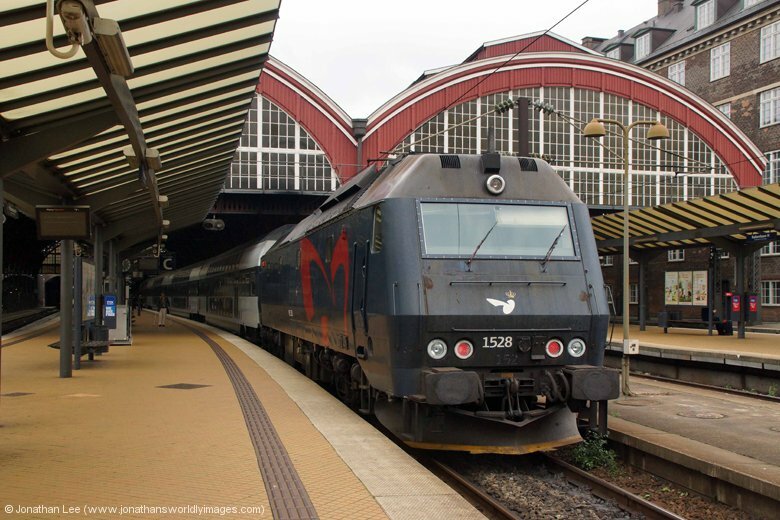 The penultimate train of the day was IC49 1823 Mora – Stockholm headed by Rc6 1386 which did just nicely into Stockholm where myself, Dave, Redhill & Fly were all doing the same train forward; the difference being I was doing NT1 2314 Stockholm – Malmo throughout and in a sleeper berth! The other difference was that I didn’t need Rc6 1407 yet everyone else did and I was the ned out of the 4 of us by a long way! I bode farewell to the three overnight kings as I headed for my berth, where I found some coffin dodger sorting his life out before he took 10 minutes to climb to the top berth; which would be me in a few more years, fact! Despite all three berths in out compartment being reserved the occupant of the middle one didn’t turn up, not that it really mattered, and immediately after departing Stockholm our tickets were checked and that was that; lights out! While not the best night’s sleep it was still decent enough for an overnight and I was woken by the guard announcing that we were approaching Lund; a mere 10 minute before my alarm would wake me anyway. By the time I’d got myself up, dressed and walked to the front of the train we were approaching Malmö Central, a little late. I only had four minutes at that point to make the 0653 unit to Copenhagen but did so with ease and was dropping into spin heaven earlier than I’d hoped and unlike most new places I was surprised to find København a little easier than most to get my bearings at; it didn’t take long to figure out that most inbound hauled trains used either platform 1 or 2 and most outbound used 6, 7 or 8. 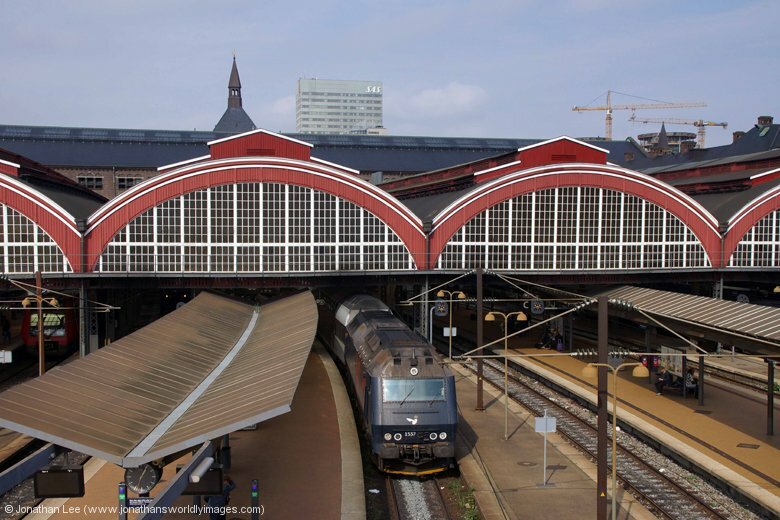 It was also soon evident that the ME GM’s were always on the out of town end of the sets and that inbound trains heading for Østerport were only shown as an Østerport train on the screen and not shown what train it actually was; which meant using the arrival s screen to confirm what the inbound trains were was a good idea, especially if doing a move towards Østerport. Without wasting any time I was soon figuring out that I probably needed to cover some of the turns that died in a morning and didn’t come out again until the afternoon rush; more to prevent having to miss something in the afternoon by limiting the amount of turns that needed to be covered. Arriving at the time I did though meant I could only cover on such turn and my red pen was off from the moment ME1522 arrived, heading to Østerport with 4206 0534 Nykøbing Falster – Østerport. 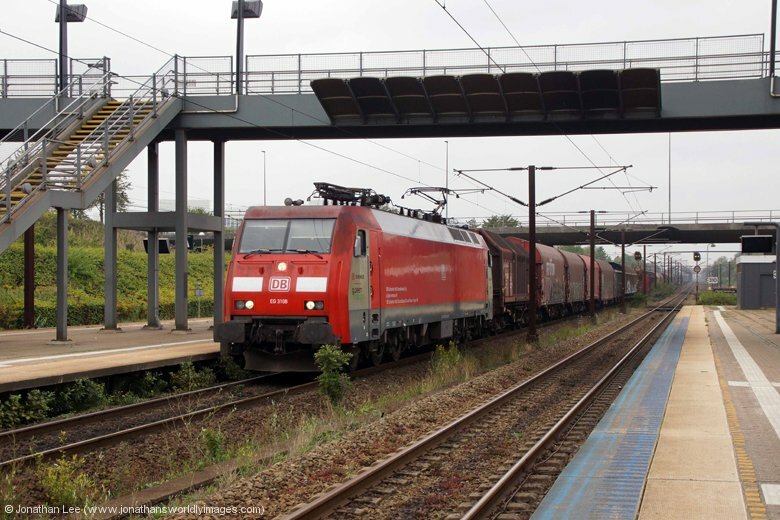 I was off at Nørreport for ME1515 straight out to Høje Taastrup on 1517 0744 Østerport – Kalundborg to cover 1512 0658 Kalundborg – København which died on arrival into the Danish capital. As always when you need everything your eyes are constantly on the scan and my pen seemed to never stop what with filling in the diagram gen and writing what I saw on a printed timetable, it was initially a little hard to keep up but soon calmed down when I’d seen quite a lot of turns. 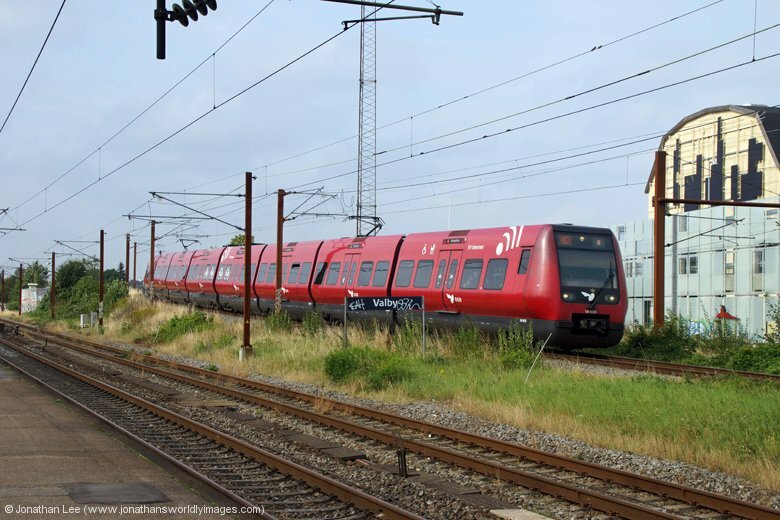 The morning was pretty hectic with everything that I saw being new of course, unfortunately though there were some unwanted DMU’s on two of the morning turns, both of which dies at København until the afternoon rush; so whether they were spare or just used vice ME, who knows? 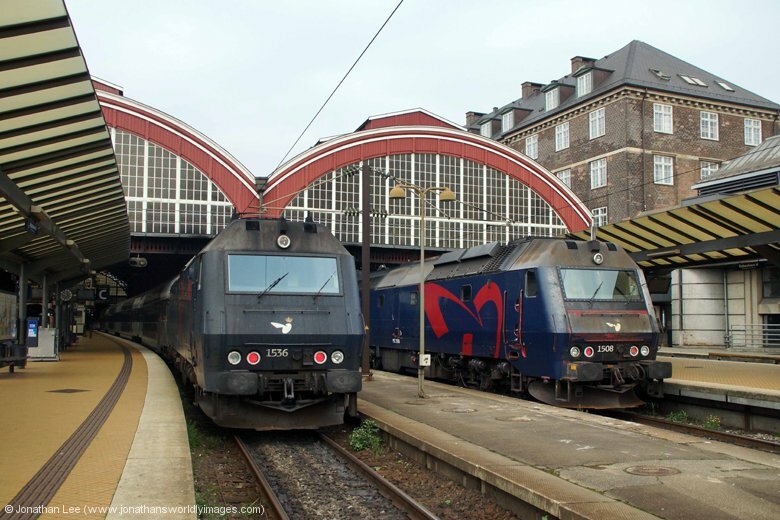 Either way both 2510 0646 Holbæk – Østerport and 3508 0738 Kalundborg – Østerport were formed of 2 sets of new DMU’s; one set actually stuck for its afternoon working and the other turn, off 3508, was cancelled outright with a set of DMU’s working a different turn in the afternoon that I don’t know if it was ME on its morning rush hour inbound; so there could have been up to 3 turns that were DMU during the day! Having seen reports from pre the weekend the EA turns had only had one of them actually loco-hauled and the other had been and EMU. It took me a while to figure out, more because I hadn’t expected it, but both EA turns, while hauled, were actually ME’s vice. I’d passed both 1526 & 1527 in the morning rush and hadn’t been able to place where they fitted in the hierarchy of things until later; when it all sank in. 1527 was on the all-day turn 851/1 and 1526 worked the rush hour turn 851/2 but only in the morning, it was replaced by 1503 in the afternoon, which had come off another turn itself. 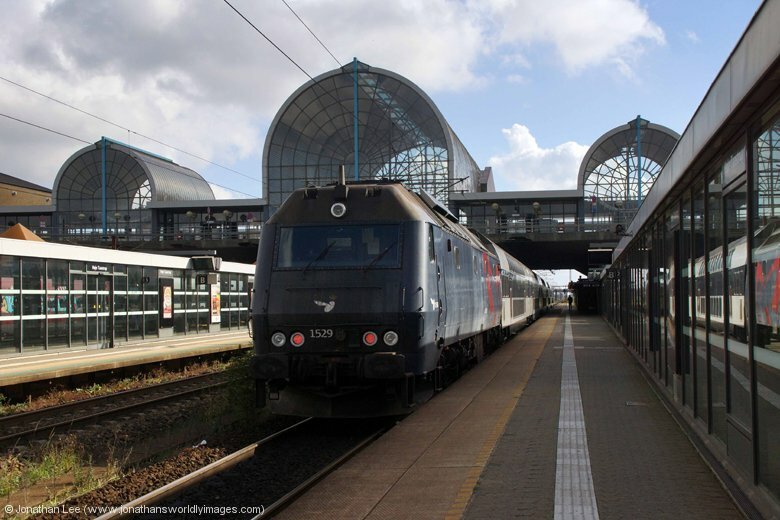 There weren’t really any surprises, other than the DMU’s and ME’s vice EA’s, during the morning and I never needed to venture further than Høje Taastrup until later in the evening; which was further than I’d actually expected to make it. As the morning went by it was easier to take stock of things, figure out what I’d covered and mark off those turns in my printed timetable that I’d already covered and pretty much everything stuck to what it should have until the afternoon rush when sets started producing from the carriage sidings again. 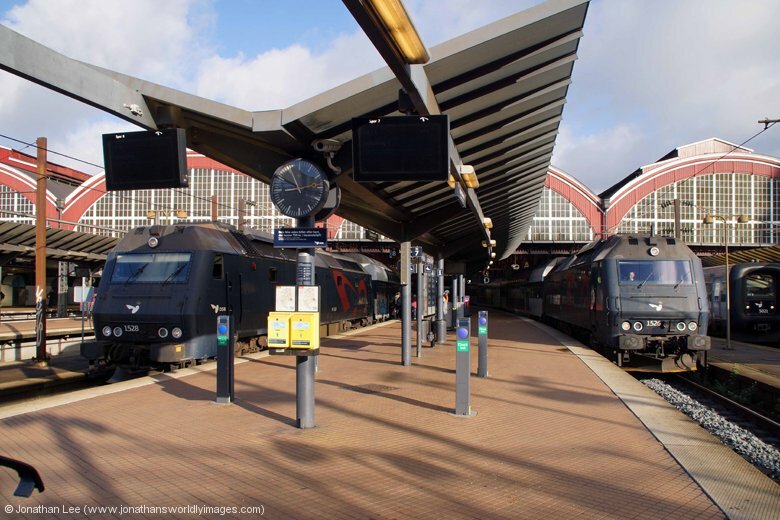 The only thing that didn’t do as booked was ME1536 which worked extra trains that weren’t booked to be hauled, after arriving with 4306 0640 Slagelse – København; namely 2517 0724 Østerport – Holbæk starting at København and running late and returning late with 2518 0846 Holbæk – Østerport which was cancelled at København, it then went back out with 2529 1027 Østerport – Holbæk and returned with 2528 1146 Holbæk – Østerport before going onto a different diagram in the afternoon rush. I took the opportunity to check in to my hotel during the early afternoon lull in new engines. The Hotel City Nebo was literally a 100m walk out of the main concourse at København; which had a makeshift refugee camp cordoned off by tape with a load of folk helping those arriving in Denmark move on towards Germany. It seems that they were even given train tickets for their journey and there were massive clothes banks and food banks and even things like pushchairs stacked up to one side. While it was obviously a nice gesture I couldn’t help but think that this was all a coordinated effort to move people on from Denmark rather than actually address the issue and accept people with open arms. It took only a couple of minutes to get to the Hotel City Nebo and I was checked in within two minutes as well. It’s a hotel that only seems to have rooms with shared bathrooms but was a decent sized hotel nonetheless with clean rooms, which were a decent size and had a sink with shower gel and a towel in the room. The bathrooms were clean as well but a bit like public toilets; still the shower was spotless when I used it and the water piping hot. Breakfast wasn’t included in the room rate but was available for DKK65. Once my bag was made a little lighter I was straight back out armed with a plan of action for the afternoon, based on what I needed to cover, which took me to Østerport for the first time to cover 1237 1433 Østerport – Nykøbing Falster which should have been ME1519; it was when 1519 rolled into the platform, while I was stood on the footbridge photting it, with 2545 1427 Østerport – Holbæk that I realised I probably needed to keep an eye out that afternoon. ME1535 that should have been 2545 sure enough was following behind with 1237. 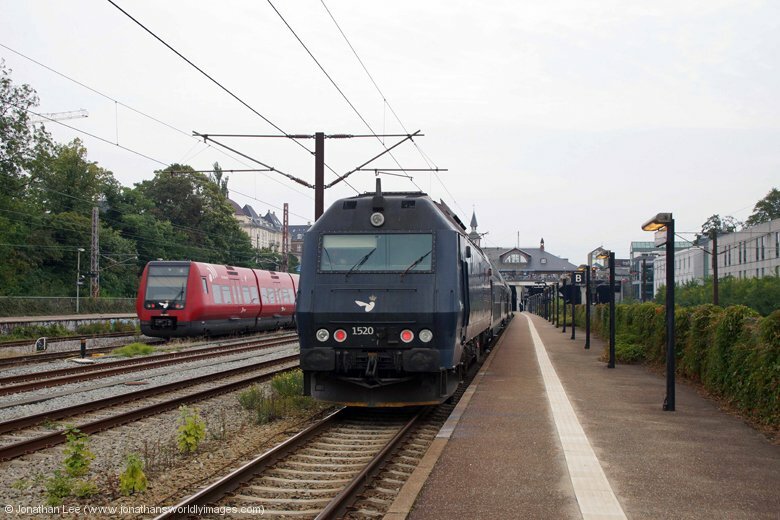 ME1518 had been sat in the carriage sidings at København all day and I’d been expecting it to drop out onto one of the turns that produced at around 1600 and I headed down to Østerport to cover both 2553 1627 Østerport – Holbæk and 4151 1633 Østerport – Ringsted; the former being unknown and the latter I was expecting to be ME1526. 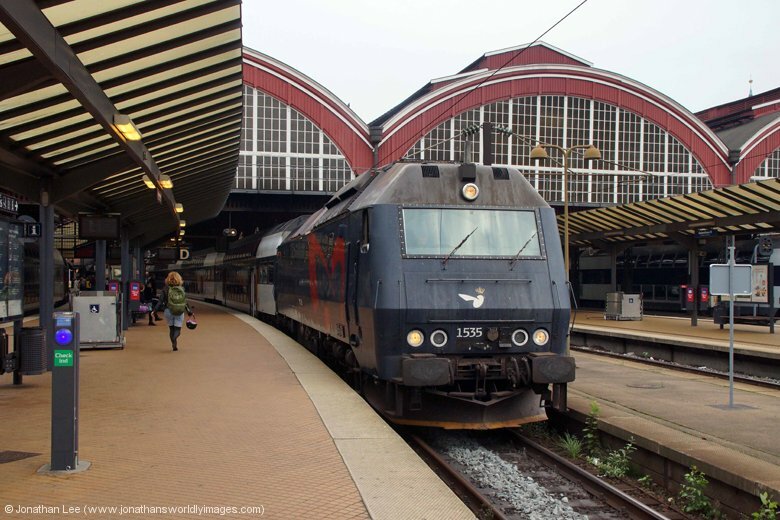 Confusion began to reign when ME1503 arrived into the station then shunted out of the south end; which should have been at København for 2247 1609 København – Nykøbing Falster. 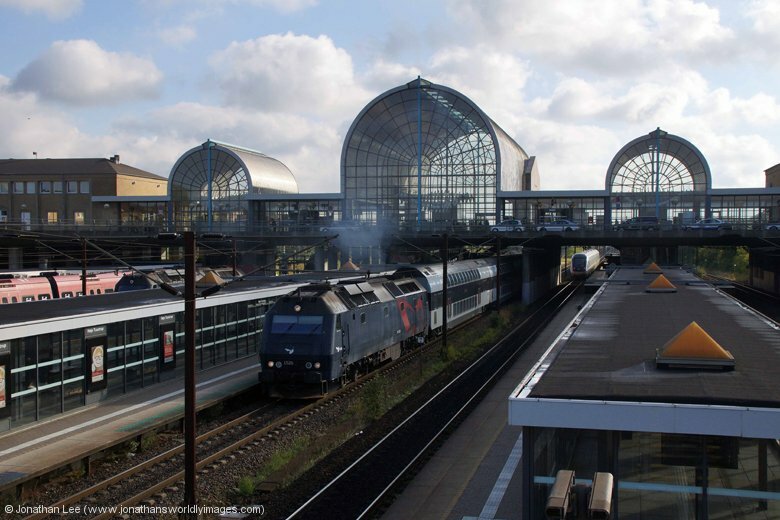 ME1520 rolled in to form 2553 and when I got into København I thought I’d better check 4249 1637 København – Nykøbing Falster and sure enough ME1526 was sat waiting to go with it so a mad dash over the footbridge followed as it was only a plus 1! 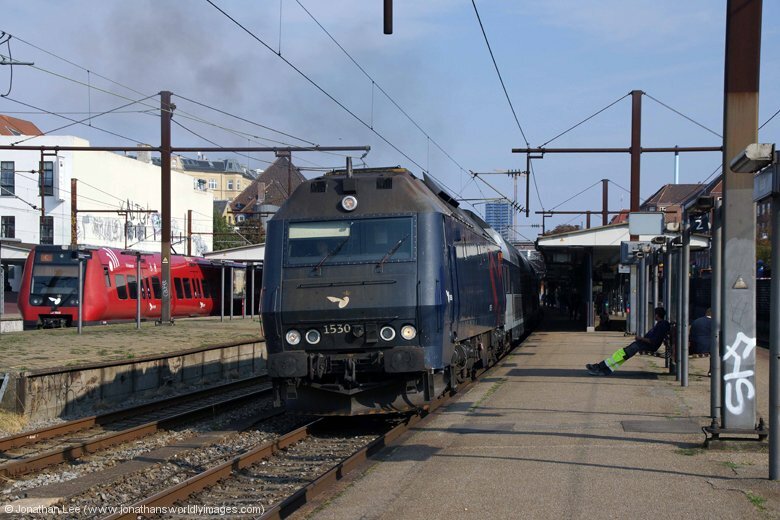 It turned out that 1503 and 1526 had swapped diagrams with 1503 following on 4151 EA turn. 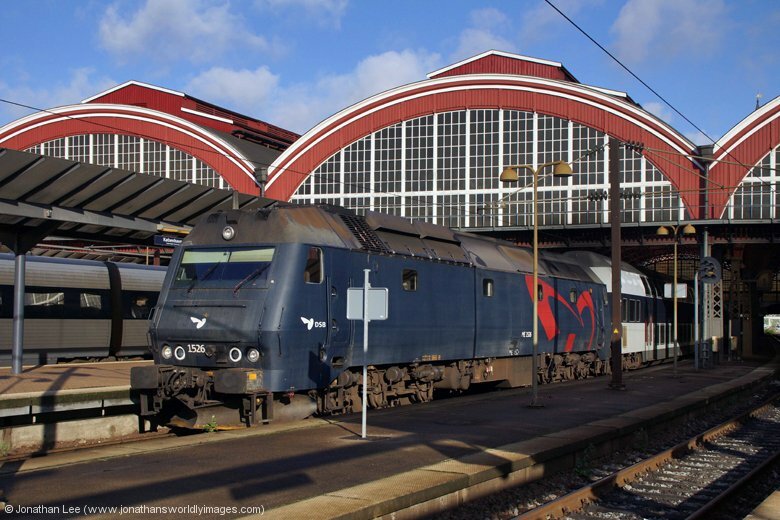 As we ran by the carriage sidings I noticed that ME1518 had gone and could only assume that it had replaced 1503 in its diagram and done 2247 1609 København – Nykøbing Falster; which was something I couldn’t confirm and I wasn’t stopping out until 2100, which was the time it got back in from Nykøbing Falster, to find out and would see if it stuck to diagram the following morning. 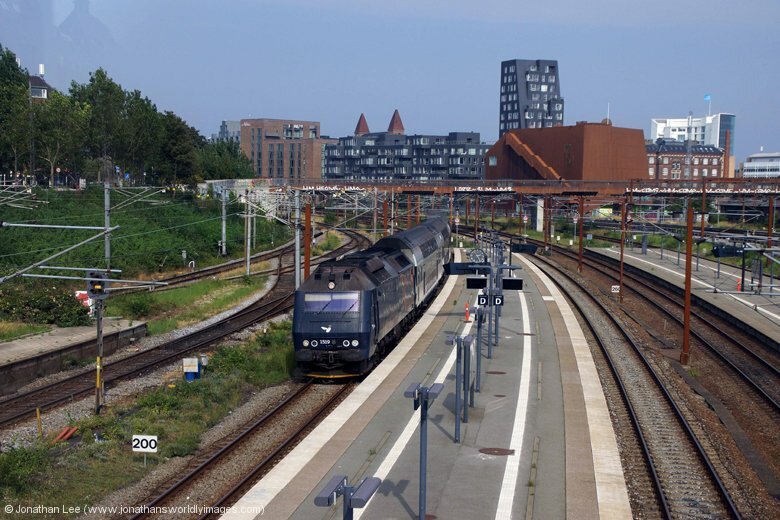 That was pretty much it for the day with just one more turn to cover so having done ME1503 forward from Høje Taastrup to Roskilde on 4151 for something to do, I returned to Høje Taastrup with ME1512 on 2548 1646 Holbæk – Østerport to cover 3553 1707 Østerport – Kalundborg which turned up with a pair of new DMU’s so that was day over and it was back across the footbridge for ME1527 back into København with 4148 1720 Ringsted – Østerport on one of the turns that had actually behaved itself all day! I was very thankful of the Poonchai Thai restaurant being over the road from the City Nebo, which served up a very good Pad Thai and at DKK124 I thought it was almost reasonably priced. Having had a couple of long days I couldn’t seem to keep my eyes open after food and found myself showered and in bed at 2000; yes that’s 8 o’clock and I was tucked up with my earplugs in! I must have needed it as I was out like a light! What happens when you go to be early, you get up early and I was just tossing and turning by 0600 so got up and headed out. Breakfast was kindly served by McDonalds on the station concourse and I was away. I wasn’t expecting much from the day based on the fact that I’d had everything the previous day and didn’t know how often the ME’s were swapped out for maintenance. 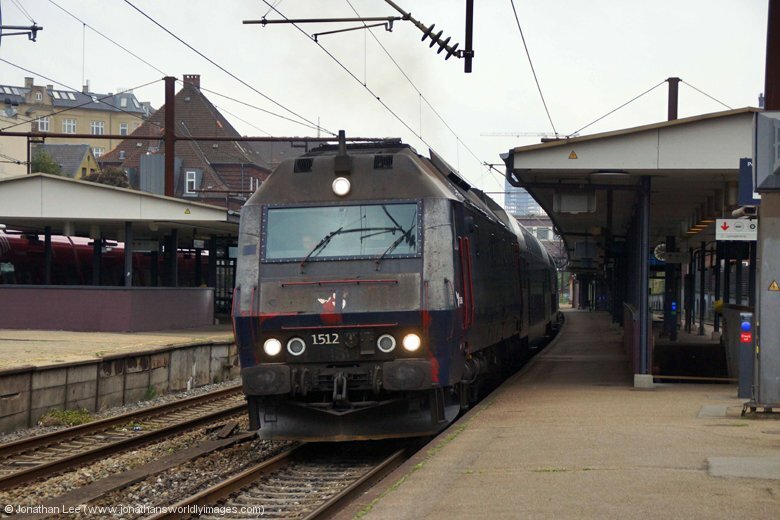 The first task was to find out if indeed my suspicions had been right the previous night and check if ME1518 had followed through on the diagram if it had dropped out onto 2247 1609 København – Nykøbing Falster. 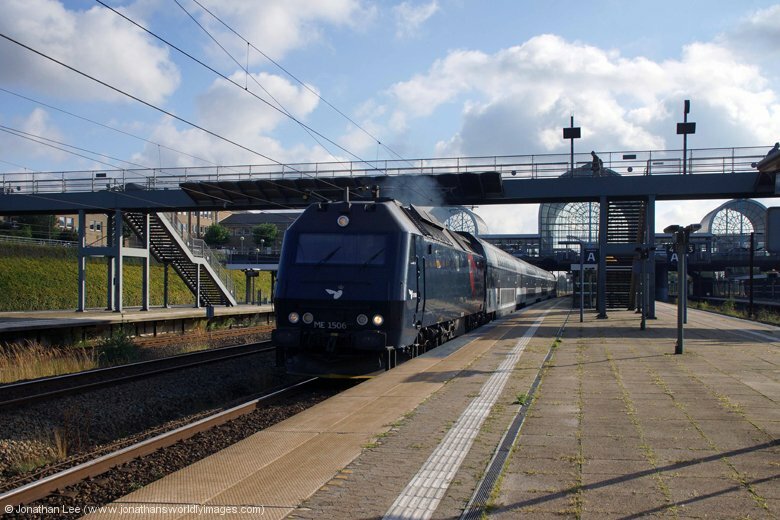 I’d originally planned to get up for it on 2213 0811 København – Nykøbing Falster but as I was up early I could get out to Valby for it coming in and was pleased to find new ME1521 on the train I did out for it, 2513 0627 Østerport – Holbæk. 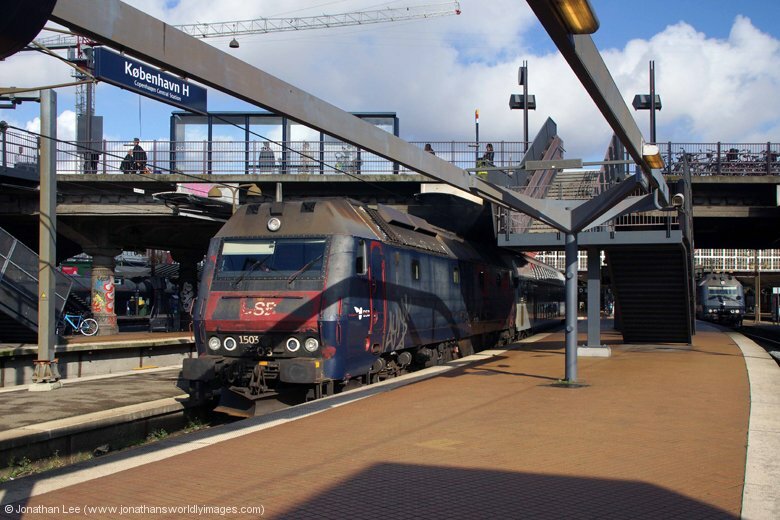 Shortly after my arrival at Valby I was also pleased to find that my suspicion had been correct, or that I’d just dropped lucky, either way ME1518 was propelling 2200 0509 Nykøbing Falster – København back into town. 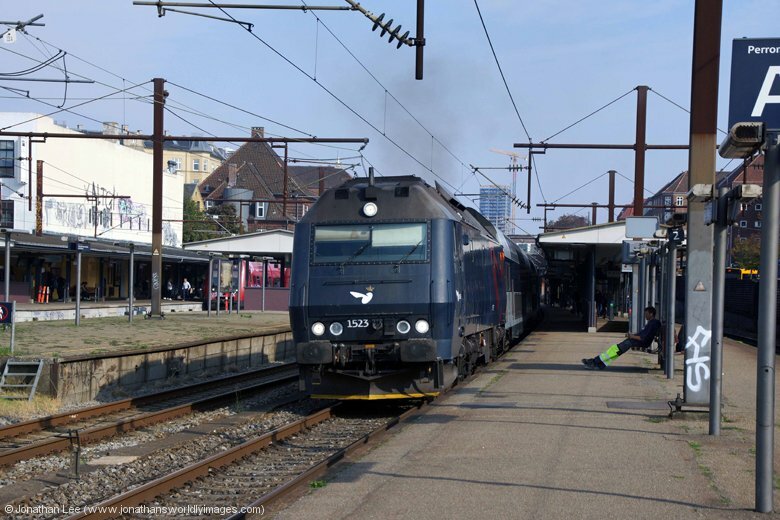 As I headed back into tow I was sure I’d seen a pantograph attached to the loco working 4111 0637 Østerport – Ringsted and I had to investigate on the return of the train as it died at Østerport until the evening rush and I was heading home by the time it would/should come back out to play. My early departure from the København arena meant that I had to cover as many of the turns that died after morning rush as I could and did so; bizarrely making a train at Høje Taastrup that wasn’t booked to stop there, which of course was assuming I’d got the train gen correct as it ran non-stop into København and terminated. ME1529 was the power and the third new one for the morning and having arrived into København with 4306 0640 Slagelse – København it then went back out on a different diagram with 2521 0836 København – Holbæk anyway, instead of heading to the carriage sidings for the day! 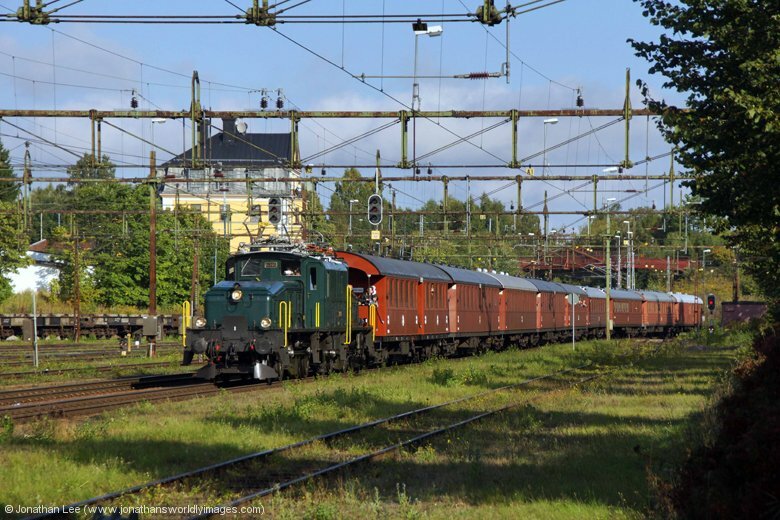 I headed out to Valby to cover the EA turn coming back in and had already found ME1519 on the long diagram 851/1 and was quite glad to find EA3022 arrive with 4110 0753 Ringsted – Østerport, just to get one in. Having viewed almost everything by that point I’d marked off what I needed to spot in my timetable and was hoping ME1504, which I’d seen on the carriage sidings the previous evening, would be on one of the turns I’d not covered yet; it wasn’t but I did come across ME1533 on 2214 0810 Nykøbing Falster – Østerport, which was the fourth and final different ME to be out compared to the previous day. 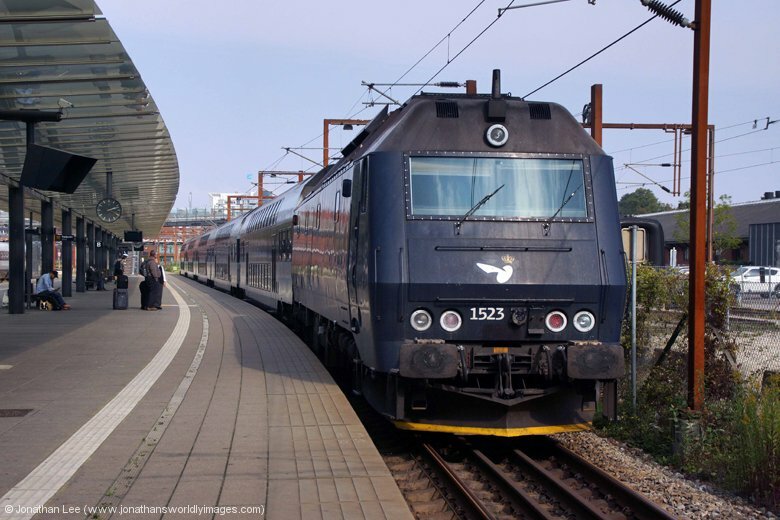 By the time I gave up at København at 1100 I’d seen every turn with the exception of one, which must have either been cancelled or a DMU as I definitely didn’t pass an ME in its path and everything was accounted for. It was a morning die turn anyway so there was nothing I was going to do about it. All the ME turns I’d seen were actually hauled with no DMU’s substituting and both the EA turns were also hauled, albeit with only one being and EA and the other an ME. I’d been considering it the previous evening and during the morning had worked out a simple bash between Malmö and Lund doing X2000’s and covering the inbound Snälltåget Stockholm – Malmö before heading to Copenhagen airport for my 1710 flight home; which Easyjet had already told me was going to be about 30 late departing! 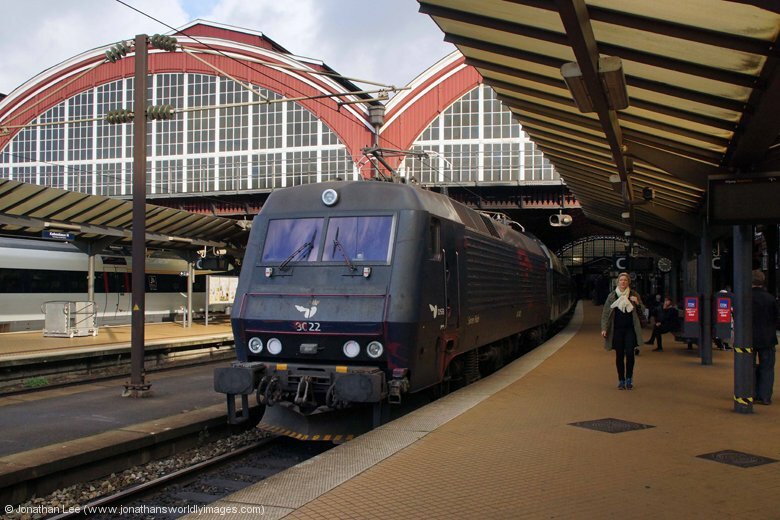 The move fell at the first hurdle when 536 1124 Østerport – Stockholm X2000 was showing on the screens to start at Malmö so I didn’t get a loco-hauled train over the bridge into Sweden and had to do an EMU to Malmö instead. 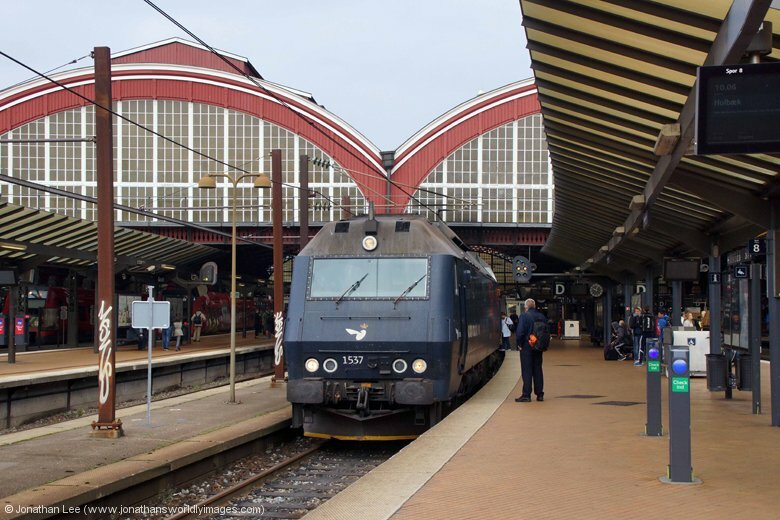 Upon arrival at Hyllie I should have realised things weren’t quite right when my train, the 1112 København – Kalmar was held in the station for no apparent reason and when the 1132 København – Göteborg arrived in the adjacent platform and had the road I leapt across for it. 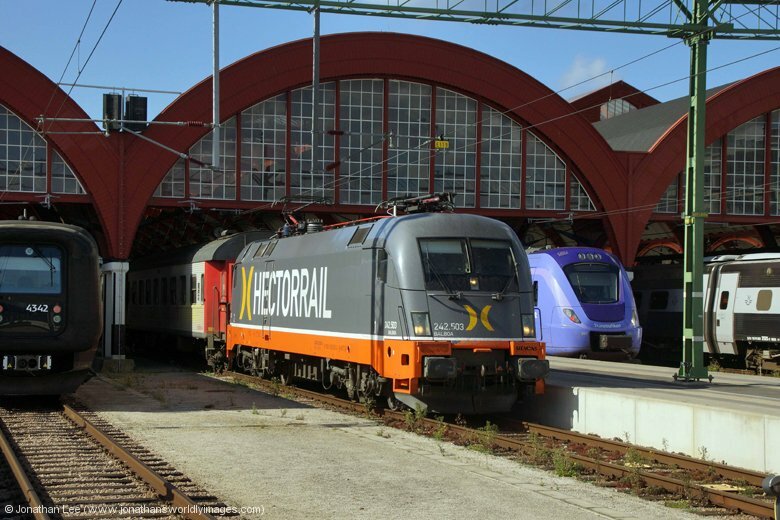 The train was already full and standing with passengers for the X2000 starting at Malmö. 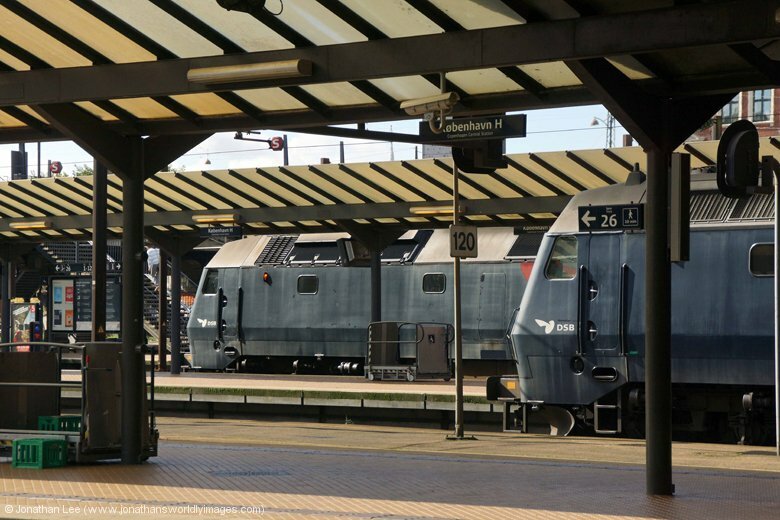 Upon arrival at Malmö all became clear; the departure boards were carnage with train cancelled and delayed and bearing in mind it was now 1215 the following were all still showing on the screen, Snälltåget 0920 Malmö – Stockholm and the 1014, 1114 and 1214 X2000 departures for Stockholm. Everything had an expected departure of 1300 and my judgement probably got the better of me when I thought there was a potential move on with the Snälltåget train. 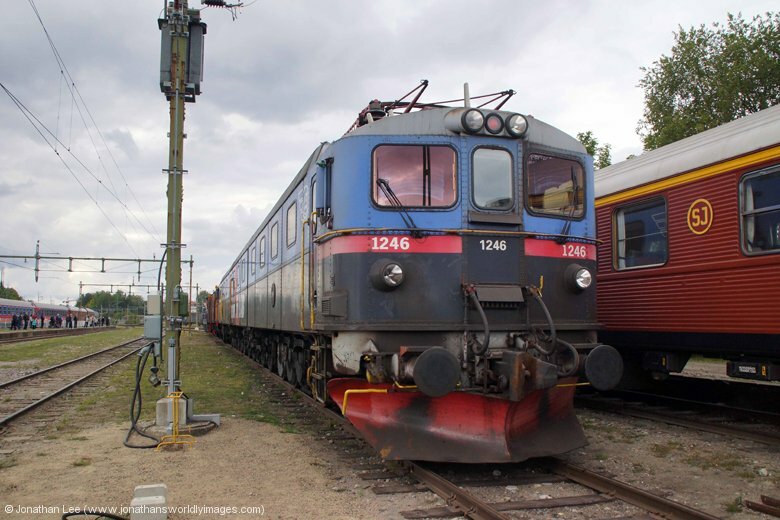 Having found Hectorrail’s 242503 (182503) at the head of the train I collared the train guard on my way back down the platform who kindly told me that a train had brought the wires down about an hour north of Malmö, across a junction. 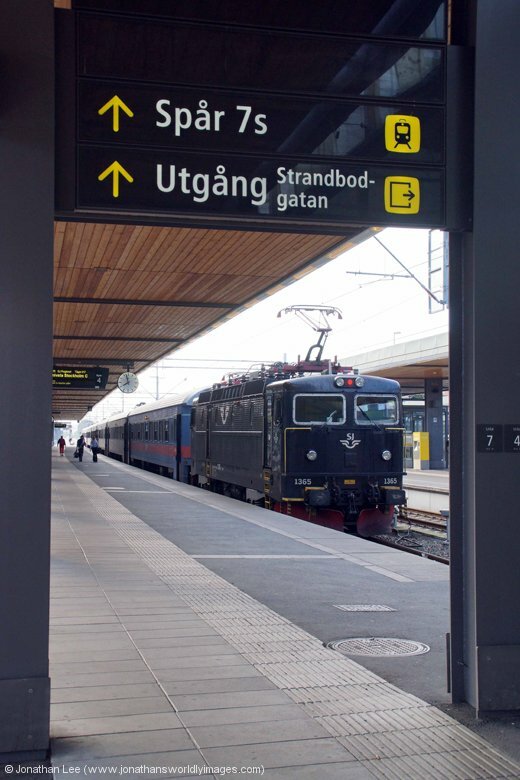 The power was currently off with there being no route to get trains north from Malmö until at least 1600. The guard was just about to re-board her train and do a head-count so the bus, that would be taking passengers north, knew how many were for each station. That, as they say, was basically the end of that! It would have been rude not to get a decent photograph of the Hectorrail machine before I disappeared, which resided in the station with two X2000 sets. 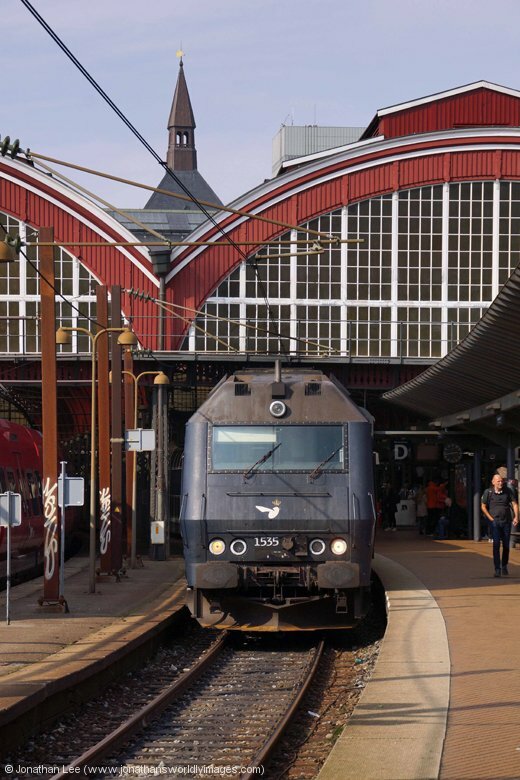 This little farce would explain why the EMU I was on got held at Hyllie as it would need to use the main line north of Malmö as well; so I guess it was being held waiting a decision what to do with it. With really no other option I headed straight to Copenhagen Airport to wait it out for my 1710 flight back to Gatwick; it would have been waste of time going back to København as I’d have had very limited time when I got there anyway, so a nice relaxing wait was had in the Easyjet departure area at F gates of Terminal 2. Despite my flight EZY5368 1710 Copenhagen – Gatwick showing late on the Easyjet App it was still showing right time on the screens and for once Easyjet actually impressed me with their efficiency in boarding as opposed to making a right mess of things; the moment the plane landed people were let through to wait in a queuing system and by the time the plane was ready to board everyone was through and waiting to board. We were only 15 minutes late away and landed only 5 minutes after our booked time. The journey wasn’t without its perils though as I seemed to be sat next to the world’s most clumsy woman who’d already knocked her tea over on her tray-table immediately after buying it, the teabag of which ended up being dropped on my laptop as she handed over her rubbish to the steward! She was very right when she muttered to me “you seem to be sat in the wrong seat today, don’t you?” and I told her so! 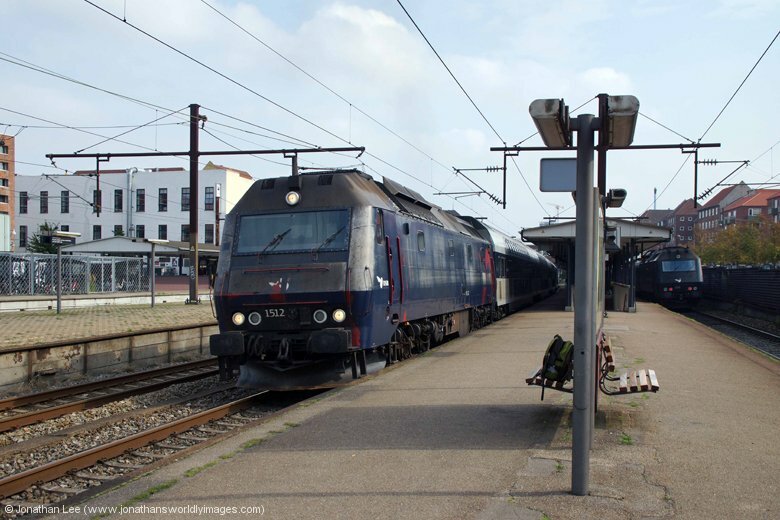 Note to self, even though there appears on paper to be enough time to get from an airport to your booked train home it’s always a good idea to check just how tight the move is. When the plane was expected to be 30 late arriving I was expecting to miss my 2005 from Kings Cross back to Doncaster but as luck had it a swift run through the airport, and no queues at all at passport control, had me on the platform for the 1838 to St Pancras low level with 10 minutes to spare! This actually being the last direct train I could do to St Pancras to make the 2005 while the London Bridge farce is on! If I’d not already walked into one farce on this day I was about to walk right into another. Thankfully I already knew as Pelham was on his way to work and had informed me of a complete power failure at Darlington before I left Denmark, which had been cleared up by the time I landed but replaced with a body having been spotted on the line at St Neots; which well and truly screwed the ECML for the rest of the day! I rolled up at Kings Cross at 1940 to find the 1900 Kings Cross – Edinburgh on the screens with an estimated departure of 2000, my booked 2005 Leeds was just showing delayed; so food got flagged in favour of actually making it home at a reasonable time. I asked the guard if I could use my advance ticket on her train as there was no issue at all with the disruption occurring and as I got to the front of the train 67024 was just shunting out of the bay; the man with orange gloves stood beside 91124 kind of gave the game away and a member of Virgin staff soon confirmed that the train was being dragged via Cambridge; which really wasn’t what I wanted to hear as it would be a very late finish indeed. Just as 67024 was dropping on to the train Pelham rang to tell me to do the 1900 anyway, which was now going main line as the down line would be given back momentarily; which was definitely good news. I managed to find a seat in coach B before there train ended up dangerously overcrowded with people wedged down the aisles, even sat in them, and wedged in the vestibules too. Virgin did themselves a favour though and had a set sat at Peterborough to alleviate the situation and all those stood or without seats were shipped across to 91109 and train, which would follow behind to Newcastle. The run from Peterborough to Doncaster was crap though and we must have been following a Leeds stopping service as we were stopped outside Grantham, Newark and Doncaster en-route, arriving Doncaster at 2211; which for me was actually only 28 minutes later than I was expecting to arrive off the 2005 Leeds but for others it was well over an hour late! I was glad to be off and on my way home, having had a very strange day since departing København. I was hoping that my jinx didn’t follow me back to Holland/Switzerland the following night! Note: the wires were down about an hour north of Malmo with something having brought them down over a crossover resulting in no trains at all running north of Malmo until at least 1600! lovely report on Gävle &c on 13 September 2015. I was there a day before and was returning tot Denmark the 13th -and are regretting that choise of not having bookend a 2nd overnight stay at Gävle. 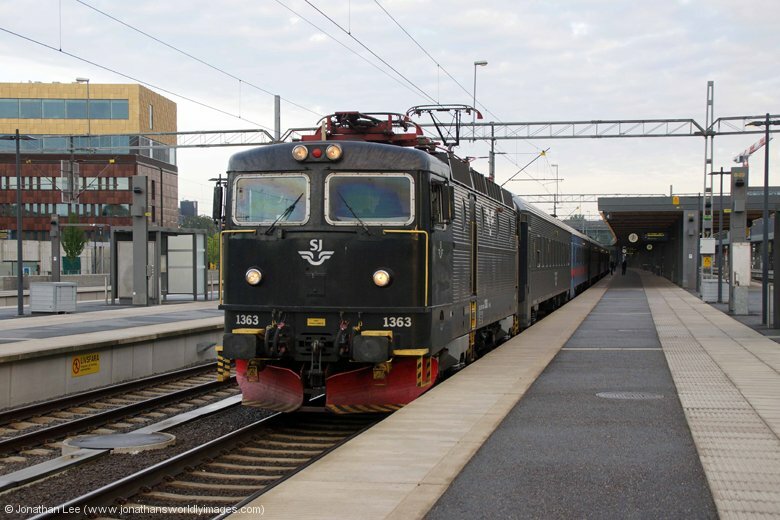 The El 13 you saw running past did leave Gävle on the 13th at about 11;00. As far as I know, Gävle organises every year some kind of spectacle. although without such bonanza-extravaganza like Swiss crocodiles!